MK Lapid visits Sderot, says it's 'inconceivable' that Hamas leaders sleep in their beds while Israeli children sit awake in bomb shelters. 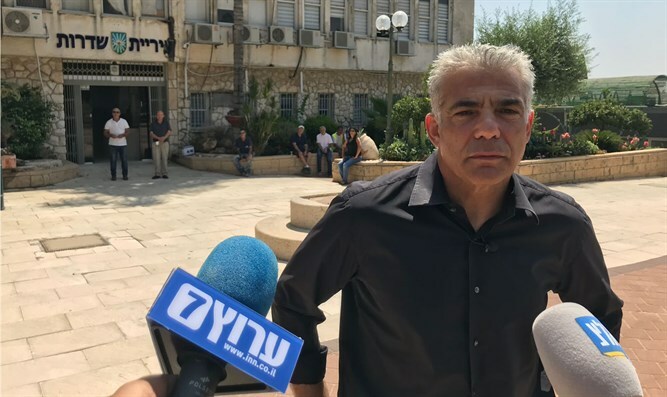 Yesh Atid MK Yair Lapid on Thursday morning visited the Gaza border city of Sderot, to show support for the city's residents who spent the night in bomb shelters. "It is inconceivable that children in Sderot will be awake in bomb shelters, but [Hamas leader] Yahya Sinwar is sleeping in his bed," Lapid told reporters. "It is inconceivable that Hamas has changed the rules of the game, and decided that it fires the last shot." "In the short term, the IDF needs to fight them with all their strength, without hesitation, without thinking that this is not the time to make an agreement, it's time that the State of Israel made it very clear that we're the powerful ones in the area. Later, we can go back to talking about an agreement." When asked whether he believes the IDF should begin a military operation in Gaza, Lapid said, "If there's a need, we should begin another operation." "A war needs to be on the table, and Hamas needs to know that we're not deterred, Hamas is deterred." When asked if he would join the coalition in order to "give support" to the war, Lapid said, "I support the government [in deciding] to go to war if necessary. I don't need to join any government, I can do it from here, just like I'm visiting Sderot."